Add the tea and crushed cardamoms with about 1 & ½ cups of the water in a saucepan and bring to boil, once the water starts to boil add the bicarbonate of soda let it simmer for about 5-10 minutes and then add the rest of the water and boil until the pink color comes out. Now bring the heat down to medium low and add the milk, salt, sugar and let it boil for 5 minutes. Whisk the tea to achieve a slight froth, you will have lovely pink color to your tea by now, if you prefer to have a lighter color you can always add in more milk, choice is yours. 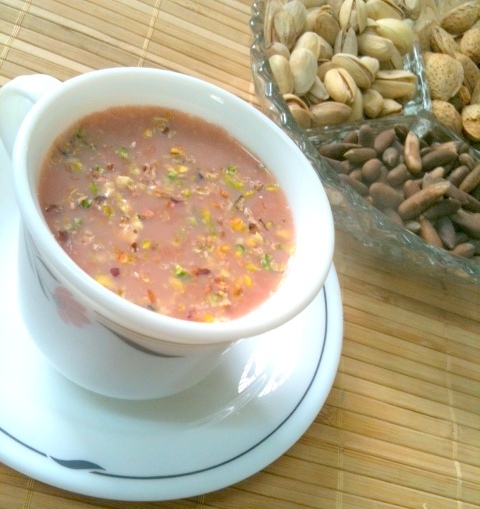 Pour in to cups and sprinkle with crushed pistachios and almonds and enjoy your tea on cold wintry evening.